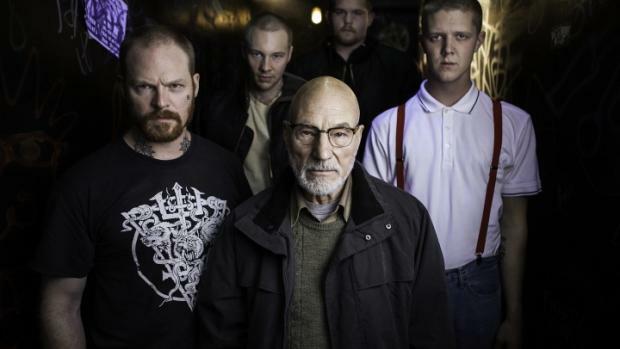 Green Room has gotten a lot of word of mouth mainly due to the fact that it has acting legend Patrick Stewart in it. Despite this it is not mainstream enough that my local cinema would show it, and so I had to travel to the next town over, but would it be worth the journey? 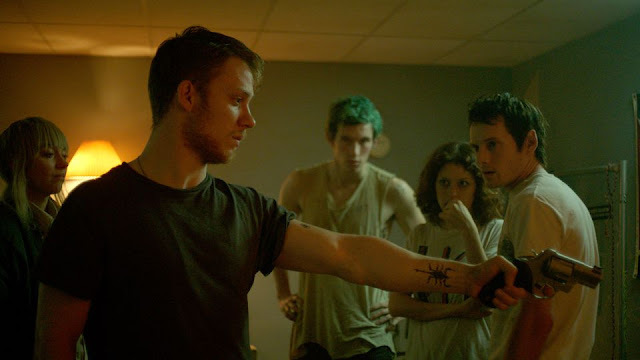 I really enjoyed Green Room, despite covering old ground it felt fresh and featured decent acting, not just from Stewart but all the young main cast. After an initial set up showing the groups ethics and way of life the horror aspect gets going around twenty minutes in. At times this felt like Straw Dogs, the local populace rallying around to assault the gang. Stewart had a more sizable prescence than I had expected, he gets no action scenes really but he is more the overseer, the one who formulates the tactics to end the siege using charisma and brain power to lead his troops. The special effects are fantastic, and looked real enough at times that I winced at what I was seeing. These are mostly body effects that range from an arm getting hacked up with a machete to brutal dog attacks and a belly being sliced open with a box cutter, all grim things that happen infrequently enough that they never loose their impact. Gun effects are short and snappy, feeling no less violent for their lack of spectacle. The plot is simple enough, a few side ones but the overall 'survive until morning' film trope is entertaining with the gang constantly making attempts to leave their green room, usually resulting in them retreating back minus a few more survivors. The initial siege was all sorts of tense, kept making me wonder just what I would have done in that situation. Death scenes are brutal but not prolonged while the inclusion of a crazed dog felt quite novel. By the end I wasn't quite sure how it would all turn out but was satisfying enough with a delicious muted finale. This is mostly played pretty seriously but there are moments of humour, such as when Darcy mid escalation walks past the bands instruments out in a hallway, pauses then earnestly states "that's a fire hazard" before walking on. There was a reoccurring gag about a desert island disc question that really outstayed its welcome though. 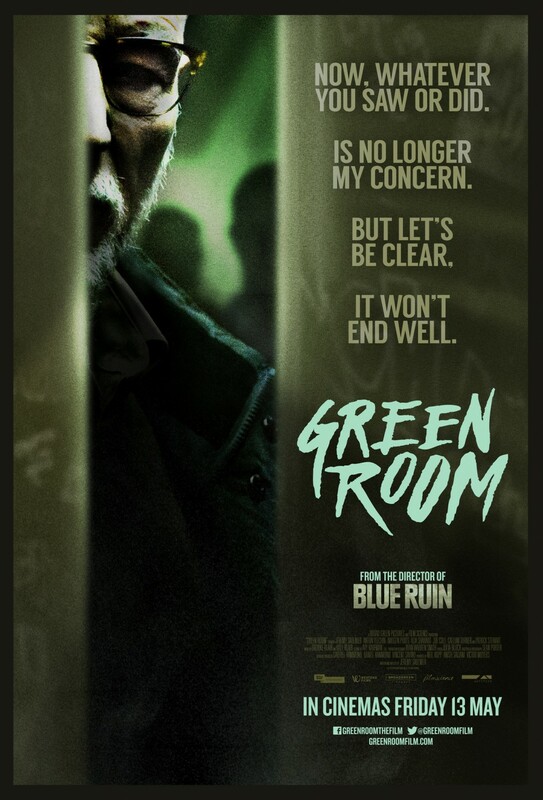 With great special effects, some solid acting and good directing (Jeremy Saulnier who also directed the fun Murder Party) Green Room while hardly the most original movie was riveting, it is testament to the actors that even playing alongside such a screen icon they did not get overshadowed.